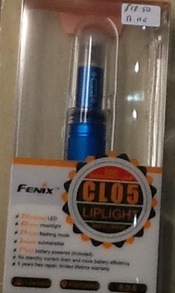 Fenix CL05 mini LED lantern is a compact, lightweight emergency light that runs on a single AAA battery. CL05 features a tail cap twist switch operating a Tri-colour LED with 7 output modes. The light is waterproof to 2 metres depth for all weather use and weighs only 12.8 grams. A great product for every day carry, emergency lighting and clipping to a backpack etc. With no standby battery drain, CL05 is also suitable as an emergency candle during power cuts.